I am the Dream Machine! 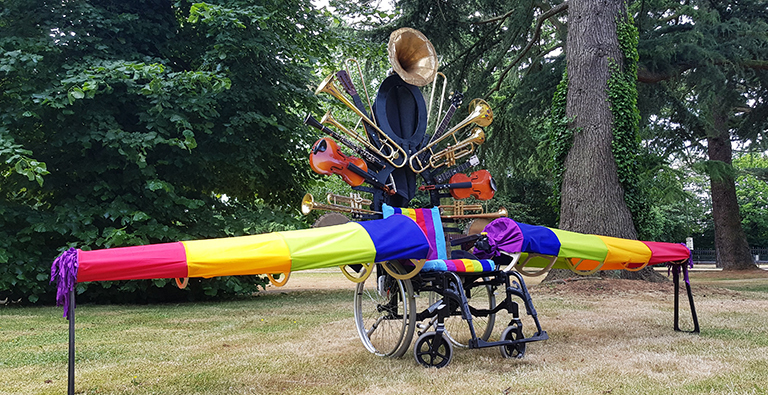 We’ve been working with the talented team at Electric Umbrella to bring their magnificent Dream Machine to life ahead of their performance of ‘I am the Dream Machine’, a pop-opera dreamt up and directed by Max, who has Down syndrome. 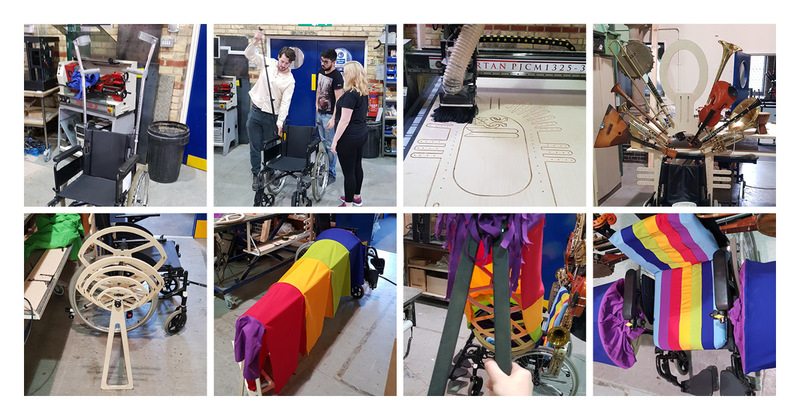 Over 12 weeks we took Max’s vision of the Dream Machine, a fantastical flying wheelchair that writes songs inspired by people’s dreams, from paper into the real world and onto the big stage! From wheelchair to Dream Machine! Snapshots of our design and manufacturing process. 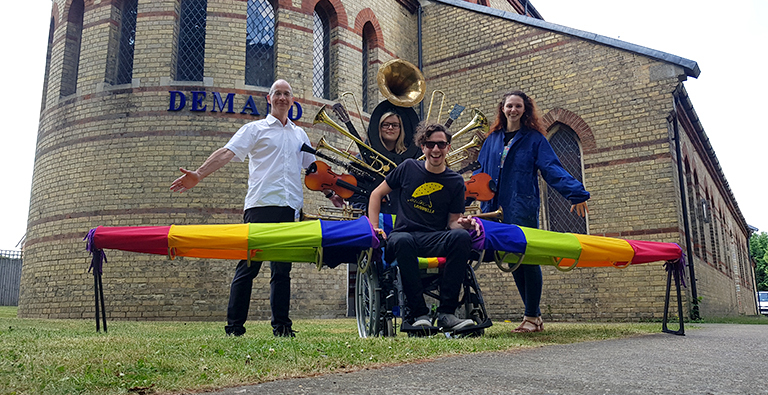 As supporters of Electric Umbrella’s work empowering people with learning disabilities to take centre stage, we were keen to support their ambitious new project. We were thrilled to work with Electric Umbrella to help shine a spotlight on the talents of disabled people. The completed Dream Machine in all its glory! Find out more about Electric Umbrella’s work on their website. Find out how you can support more life enhancing projects like this. Brody is 5 and has an as-yet undiagnosed condition. He also has epilepsy, autism and hypermobility syndrome which together mean that Brody is unable to speak and can only walk for short distances. His motor challenges mean he isn’t able to pedal a bike, but he loves to scoot about on his Scuttlebug trike. Brody is fast outgrowing his Scuttlebug and exceeding the weight limit for safe use. His mum explored many solutions before stumbling across one of our previous projects online, a trike for Summer, who has Rett syndrome. She had reached out to toy manufacturers to ask if they could provide a bigger ride-on scooter for her son, but even with support from other parents of disabled children she reached dead ends. Without access to an activity that expends a great deal of energy, Brody is likely to miss out on the valuable exercise that keeps him healthy. He doesn’t have the ability to run and jump around, so riding his Scuttlebug trike is one of the only ways Brody can keep active. Luckily for him, our team had the perfect solution. 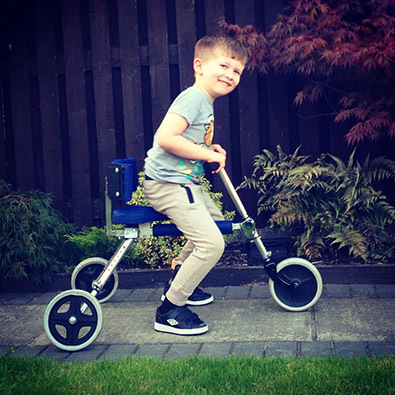 Following a home assessment to gain an insight into Brody’s needs, our engineers agreed to build a larger and sturdier trike that Brody can push with his feet. With built-in height adjustment, this custom made trike will last him for many years to come. Play and physical activity are an integral and vital part of childhood, and for Brody, who is unable to access many activities that children his age enjoy, enabling him to play alongside his peers and siblings is a great freedom. Having access to a suitable trike will at last provide Brody with opportunity for inclusion rather than exclusion yet again. James is 5 and was born with Coffin Lowry Syndrome, a rare and life limiting genetic condition. He has severe learning difficulties, communication delay and low muscle tone. He needs constant supervision as he is unaware of dangers and hazards around his home. 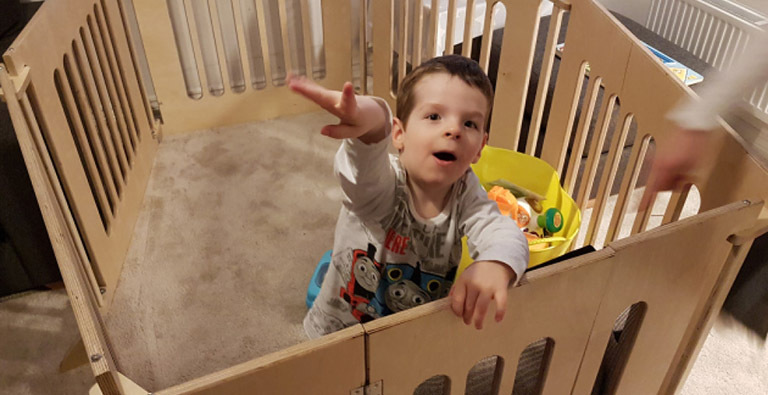 James’ parents got in touch with DEMAND looking for help to keep their son safe and make everyday life more manageable when they could no longer find a playpen suited to his needs. Using a playpen has always been essential for James, it keeps him away from things that could cause him harm and allows him to focus on a toy or activity without getting distracted and crawling away. James outgrew his playpen this year, making it unsafe for him to continue using. Now James and his family have a suitable place for James to play and explore his independence without coming to any harm. Jack is 7 and enjoys being part of his Beavers troop in Carpenders Park. He has mild cerebral palsy which affects his mobility and coordination, so uses crutches and his walking frame to help him get around. An integral part of life as a Beaver is taking part in activities and expeditions in the great outdoors. When he turns 8, Jack hopes to become a Cub, and eventually a Scout a few years down the line. To allow him to continue scouting, Jack needed a reliable way to get around on uneven ground in woodland, grassy areas and rocky paths. He simply can’t keep up with his friends and the uneven ground makes it almost impossible to use his walking frame or crutches safely. When Jack moved from Beavers to Cubs this year the plans for expeditions became more adventurous and Jack’s parents were concerned that he would be excluded from trips if he couldn’t walk the long distances needed to keep up with his troop. They looked to DEMAND to get help finding a solution. A wheelchair would solve the problem, but Jack’s parents didn’t want him to become reliant on a wheelchair since the exercise and activity he gets from using crutches helps to keep him mobile and strong. We agreed to adapt a wheelchair so it only works when tipped up and pushed by someone else, great for helping Jack move over longer distances, but definitely no match for the crutches that help Jack get around under his own steam. 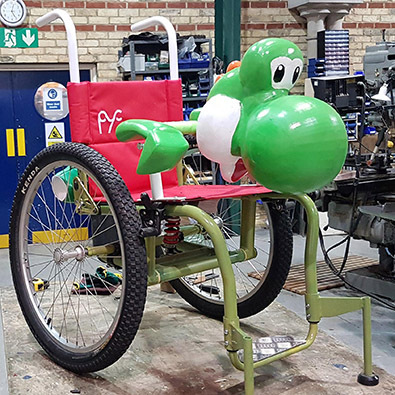 Jack loves all things Super Mario, so our designers hatched a plan to transform Jack’s all-terrain vehicle into his favourite character, Yoshi. Much like in the Super Mario world, Yoshi is always there to help Josh get where he needs to go. 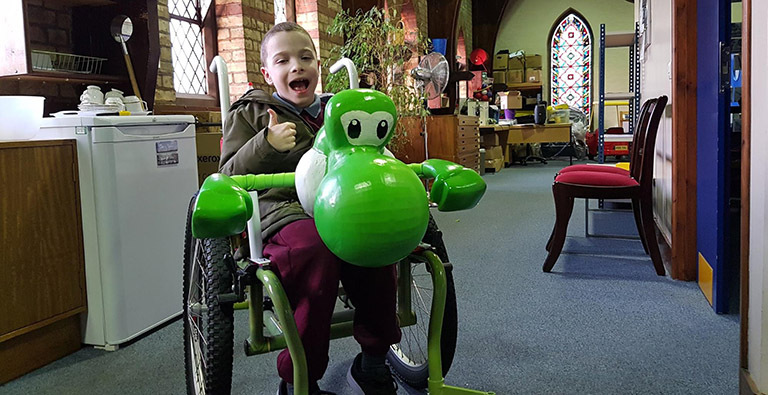 Josh is the envy of his fellow Beavers aboard his very own all-terrain Yoshi! 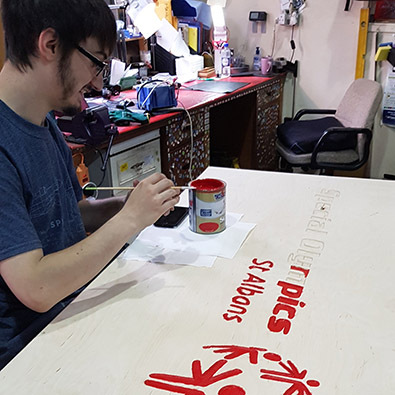 A special mention goes to PYC Upholstery who kindly offered their time and expertise to create the fetching red seat for Jack’s chair – we think it’s the perfect finishing touch! John-Julius lives with his family on the remote Isle of Lewis. 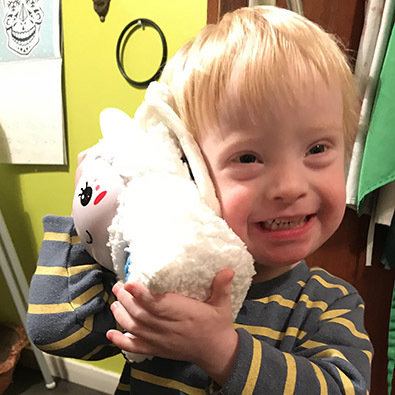 He was born with Down Syndrome and his favourite toy is his ‘Honey Bunny’ music player. “It makes long car journeys fun for him. It can mature as he matures, with different music going on to the SD card inside as he changes and develops. The problem is the speaker on the back. John-Julius likes to put his mouth on speakers for what I assume is sensory feedback. This means that a lot of his saliva ends up inside Honey Bunny. Initially when he got the toy my concern was over hygiene. I was taking the toy apart by night and cleaning out the speaker with toothpicks. I once found tiny crawling things inside. Last month, the speaker actually gave up and stopped working altogether. John-Julius is extremely attached to this toy. It’s one of the first things he signs for in the morning and he spends most of his time at home with either Honey Bunny or books. He was so sad that I immediately bought a replacement. Having learnt of Maeve’s extensive attempts to solve the problem, including purchasing a fluffy sheep ‘costume’ for the toy in an attempt to protect the speaker, we agreed to put out heads together too. We made and fitted a plastic cover inside the toy so the electronics are protected from any fluids coming through the speaker holes. Maeve is delighted to have such a practical and unobtrusive solution to a long standing and frustrating problem. John-Julius is just glad to have his bunny back for good! If you or someone you know could use some creative help with a chellenge of their own, get in touch with our team today. Rowan’s mum shares a #DreamBig story. “It’s kind of a tradition for us to enjoy a board game after school. We often unwind and have a giggle while dinner’s cooking. Our favourite is snakes and ladders, brother versus brother, kids versus parents or whoever else we can rope in! The boys keep a tally of their victories but it’s all a bit of fun really. 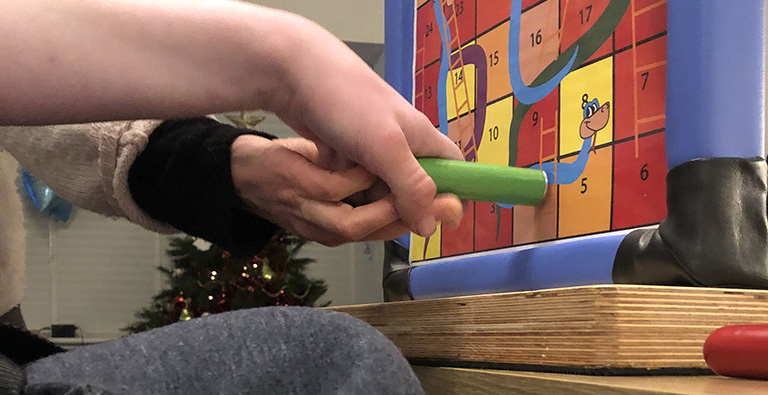 Rowan loves playing against his brother, he needs some help to move the counter because his cerebral palsy affects his grip and arm movements. We contacted DEMAND hoping they would be able to help us find a way for Rowan to play more independently. He was getting frustrated with the amount he was able to do and we just thought – why does the game have to be like this?! 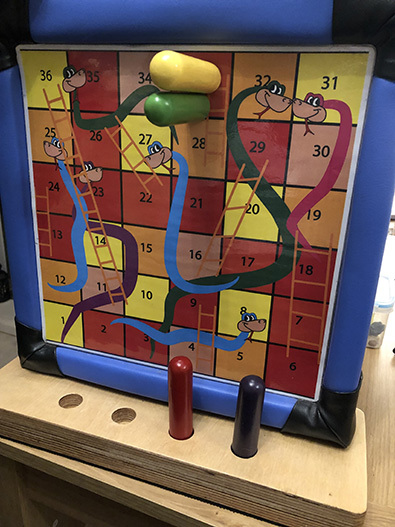 The pieces are tiny and difficult to grip, they move around the board and one knock could mistakenly send you slipping down a snake back to the start! We have a giant foam dice Rowan rolls by flinging it off his knee with a big swipe of his arm. We wanted a way for him to enjoy the rest of the game too. I #DreamBig about winning snakes and ladders. We’re celebrating ways we can overcome barriers to access and inclusion often met when following our dreams. With opportunities to break down these barriers using assistive equipment, accessible facilities and positive attitudes, we believe everyone can pursue their dream, however big or small. DEMAND is the charity working with disabled people to find practical solutions for independence and inclusion. We #DreamBig and want to join forces with everyone who believes disability should be no barrier to opportunity. We’re sharing stories from great people we have worked with to inspire others to #DreamBig too. Custom made therapy toys are helping children like Tilly and her friends engage with play and physical therapy. Our super sized cars are enabling children to once again enjoy playing outdoors when they have outgrown the push-along toys designed for toddlers. Without appropriate toys to suit their physical abilities, balance, coordination and cognitive understanding, children can be excluded from vital exercise and opportunities to play and learn with their peers. Special Olympics St. Albans contacted our team this year looking for a way to help their riders safely mount and dismount the horses during equestrian sessions. 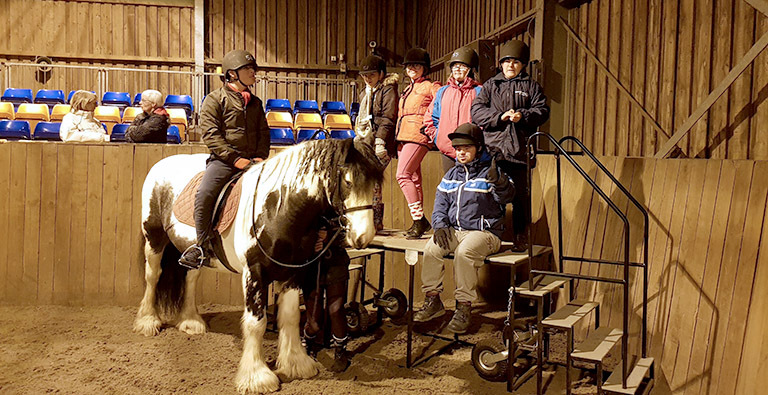 Thee riders at Special Olympics St. Albans have learning disabilities, many people also having reduced mobility and balance, meaning they need assistance from the carers and instructors when getting on a horse. Their existing mounting block did not allow for this assistance, it wasn’t tall enough and didn’t have handrails for safety and support. Our team took on the challenge to make a new mounting block that could be moved for storage when not in use. The steps have been in use since September, and although the horses took a little convincing to stand next to the new piece of equipment, they quickly got used to the new arrival and now both riders and horses are putting the steps to great use. Being able to safely get on the horses is helping the riders develop their confidence, all the while developing their core strength and posture. 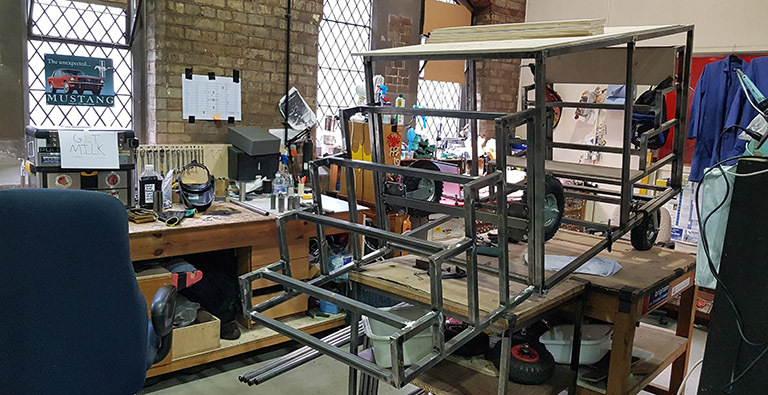 Manufacturing the steps was a huge undertaking for our team, requiring expert knowledge of frame building and welding to create the folding steps mechanism. Of course the project wouldn’t have been be complete without a hand painted logo cut on our CNC router. Happy horse riding everyone! Darcey is now able to practice walking with custom made handrails and controls for her treadmill. Darcey’s physiotherapist couldn’t find a suitable treadmill with handles low enough for Darcey to reach, so she worked with our design engineers to find a solution. The custom made handrails for Darcey’s treadmill are adjustable in height and width so they will continue to be used for many years as Darcey continues her physio journey. Doing physiotherapy exercises on her treadmill gets Darcey’s heart pumping much faster than when she walks with her sticks – which helps to develop her stamina so she can play and walk for longer. She has learnt what walking with long strides feels like so she can practice when she’s walking at school or out and about with her family – her walking is improving in leaps and bounds! We’ve been working with Herts Disability Sports Foundation to make sure even more activities are available to people with different physical abilities. Our custom made bell boat seats are helping the paddlers at Stanborough activity centre enjoy activities on the lake when they may previously have had to sit on the sidelines. Now paddlers are properly supported and able to take part along with their peers, enjoying the benefits of an active lifestyle. 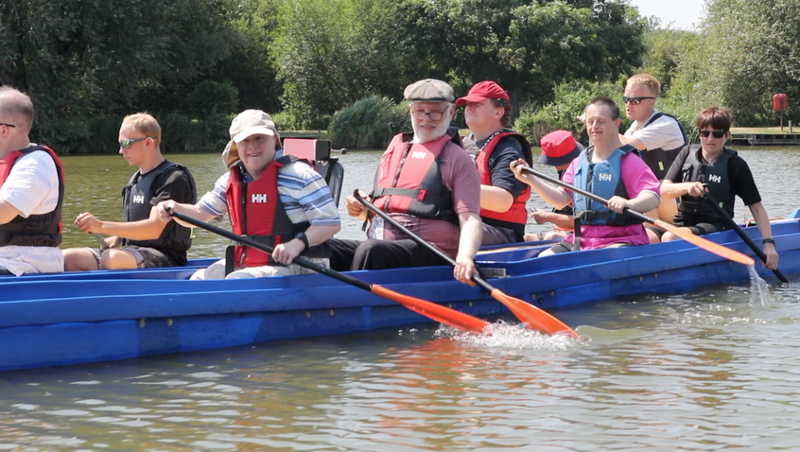 More disabled people in Hertfordshire are enjoying outdoor activities now that they can safely access the bell boats at Stanborough Park.